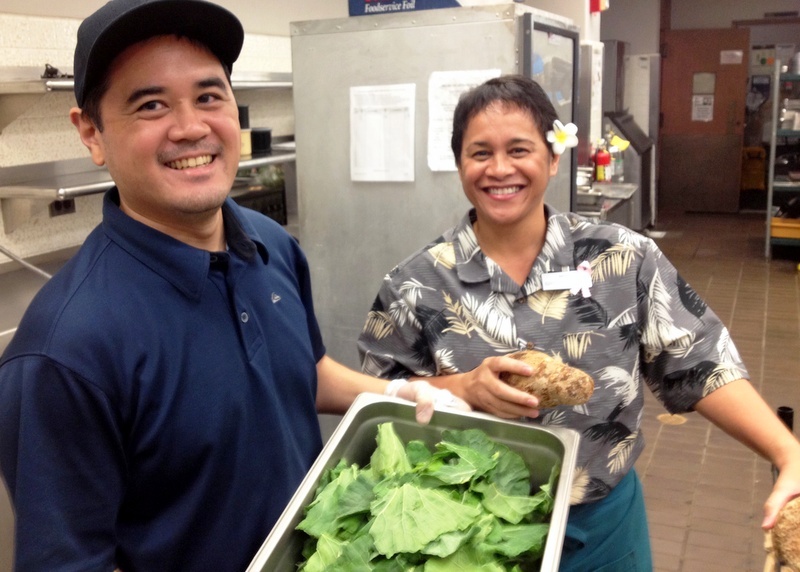 (l-r) Reid Kusano, who does catering and retail for UH Hilo Dining Services, and Bridget Awong, general manager. Kusano is holding a tray of local greens, and Awong local sweet potato. Courtesy photo. If farm-fresh vegetables with locally grass-fed beef or fresh-caught fish is your idea of the perfect meal, then the Dining Services at University of Hawai‘i at Hilo is where you’ll want to eat. Each day, 65 percent of the food served is from local sources, increasing five percent since 2012. Once a month, the daily menu is 100 percent locally grown food. This is the result of “Local First,” a program started in 2006 by Bridget Awong, general manager of Sodexo Dining Services at UH Hilo. Awong is a down-to-earth local foodie and chef who is passionate about helping local farmers while providing quality food and services to the UH Hilo community. UH Hilo is the only campus of the 10-campus UH System that serves 65 percent locally produced food. The farm-fresh fare isn’t limited to the Campus Center Dining Hall—it spans the whole campus including the residence halls. University Dining Services is under the corporate policies of Sodexo, a corporate food services company, which encourages locally-sourced food supplies. See video above right, done in 2012. For full transcript, see UH System News, Aug. 22, 2012: Local First Dining at UH Hilo. In years past, Sodexo’s fare at UH Hilo was usually made up of about 60 percent locally produced food, thanks to “local first” thinking on Awong’s part. Starting in 2012, with the full support of UH Hilo Chancellor Don Straney and in conjunction with Hawai‘i Community College and UH West Hawai‘i, Awong launched a pilot program called Local First Wednesdays, when special plates are sold comprised of 100 percent local items on the first Wednesday of each month. 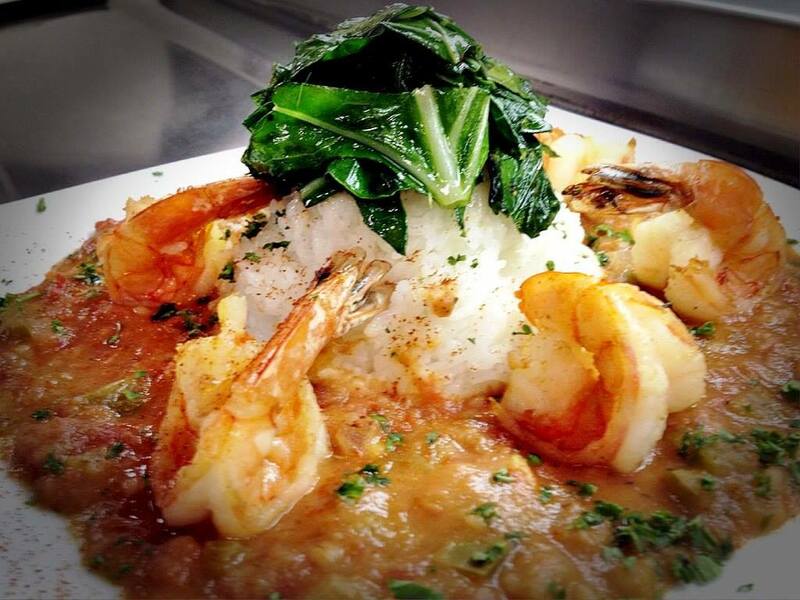 Local First Wednesday fare for Feb. 4: Kaua‘i shrimp etoufee, sweet Kaua‘i shrimp creole style in a spicy blonde roux with local vegetables. Courtesy photo. Awong says she plans ahead with farmers to ensure a year-long supply of items and to prevent everyone from growing the same thing. Of course, in Hawai‘i there isn’t enough supply to meet demand, thus some items must come from the mainland, a commonly-known situation Awong readily acknowledges. “But you make a very conscientious decision when making your menu design,” she says, noting their hamburgers, steaks, and kalua pork all come from Kulana Foods in Hilo. Awong says the success of the Local First program is because of the collaboration between her team and island farmers. True to the name of the program, Awong and her team always look to Hawai‘i Island farmers first when planning menus. All Awong’s honey for baking and cooking comes from UH Hilo’s apiary run by students under the tutelage of Lorna Tsutsumi, professor of entomology. A big part of the strategy is building relationships with farmers. Twice a year, Awong and her team do farm visits, a combination of talking story with farmers and doing some business. “We get to see what they do, we get to hear the challenges, why they do the things that they do,” she says. The Berger Family. Courtesy Hawai‘i Department of Agriculture. Click to enlarge. Awong gives the example of Berger’s Kama‘aina Farm in Mountain View, run by local farmer Roy Berger and his wife Marlene Berger with six or seven employees. A few years back, when the vog ruined all three acres of their watercress farm, the Bergers had to let their employees go and then replant all three million watercress plants themselves. Awong notes she could order watercress from a producer on O‘ahu, but instead builds her menu around Burger’s production. If the farm isn’t currently in bloom, she’ll wait until it is to put a watercress dish on the menu. Awong says she values the farm visits and getting to know the challenges that the local farmers face–labor challenges, land challenges, water challenges. “So when you make a decision, the impact is very great, when you decide, do you forgo that particular product or do you buy it from the mainland,” she explains. Often, local farmers tell her she is the first person they have met who is the end user, meaning they have never before had a local business purchasing their products for their own cooking or salads and side dishes. UH Hilo’s Local First program now uses 42 vendors for fruits, vegetables, beef, fish, coffee and more. But when the initiative began back in 2006, there were only seven or eight produce vendors providing to UH Hilo. At one point, the number of vendors dropped to three because of weather, labor, and water issues. The farms’ biggest challenges were not having distributors and not being certified. Awong explains that the farmers were not Good Agricultural Practices (GAP) certified, a food safety process farmers must pass in order to be certified to sell. Another big problem for farmers was computers and the amount of paperwork needed, so Awong offered to have someone show them how to do it. Some farmers were open and willing to receive help, while others weren’t. The biggest challenge that all the farmers share is the lack of labor. “There’s not enough labor,” she says, noting that farming is hard work and that many young people would rather have computer jobs. To build her resources, Awong has high hopes for UH Hilo Agricultural Farm Laboratory, located on 110 acres in Panaʻewa, where the College of Agriculture, Forestry, and Natural Resource Management engages in research and applied learning. They grow lettuce and other fresh fruits and vegetables, have an aquaculture facility, and raise farm animals, but all in a controlled environment for teaching and research, not as a commercial enterprise. In 2012, Awong received the Chancellor’s Certificate of Recognition for her work on Local First. “The Chancellor, bless his soul, he’s been so supportive from day one with our program,” she says, fondly remembering her shock when she was surprised with the award at UH Hilo’s 2012 Spring Commencement. She says she felt honored and humbled. After the ceremony, people from the community came up to her and thanked her for buying local products from local farmers.